We’d love your help. Let us know what’s wrong with this preview of Grilling the Subject by Daryl Wood Gerber. As the Wild West Extravaganza rides into Crystal Cove, California, Cookbook Nook store owner Jenna Hart is ready to indulge her appetite for grilled and barbecued treats and maybe even try the Texas skip. But when the body of one of Things heat up for bookstore owner Jenna Hart in the latest Cookbook Nook mystery from the Agatha Award-winning author of Fudging the Books. To ask other readers questions about Grilling the Subject, please sign up. I gorged myself on this latest installment in the Cookbook Nook series by Daryl Wood Gerber. But it didn't fill me up; I want more! Our heroine Jenna Hart is hard at work getting her specialty bookstore ready for the Wild West Extravaganza in the charming Californian town of Crystal Cove. Quickly things turn deadly, and with no alibi AND an ax to grind against the victim, Jenna's father is the prime suspect. It's up to Jenna to clear her father's name and find out who really did the dirty deed. I gorged myself on this latest installment in the Cookbook Nook series by Daryl Wood Gerber. But it didn't fill me up; I want more! Our heroine Jenna Hart is hard at work getting her specialty bookstore ready for the Wild West Extravaganza in the charming Californian town of Crystal Cove. Quickly things turn deadly, and with no alibi AND an ax to grind against the victim, Jenna's father is the prime suspect. It's up to Jenna to clear her father's name and find out who really did the dirty deed. Jenna Hart helps her aunt Vera run a culinary cookbook shop in Crystal Cove California, The Cookbook Nook. Everyone is excited for the Wild West Extravaganza complete with horse races, rope jumping and more. Shane Maverick used to work with Jenna in advertiseing before she came to Crystal Cove. He is now a promoter for the Wild West Extravaganza. He is in a property dispute with a local named Sylvia after Shane had moved across the street from her from the local land owner. Sylvia is murdered after her house caught on fire and she was stabbed with a implement sold at her shop. Sylvia was not well liked among the locals in the area including Jenna's father,Cary after he complained about loud noise from one of Sylvia's many parties. When Cary is accused of the murder Jenna stops at nothing to try to rope in the killer even with a chilling secret coming back to haunt her that could possibly jeprodize her relationship with her current boyfriend, Rhett. I always antisipate the themes in every Cookbook Nook mystery although this one didn't thrill me the BBQ dishes and the murder never failed to keep me interested. The unbeliveable drama in Jenna's life along with the murder made Grilling the Subject a page turner, Shane was a new down right arogoant character that you love to hate. I look forward to reading and reviewing the next book in this series. In the fifth book in this mouthwatering cozy series, Jenna, owner of The Cookbook Nook, has stocked the shelves with books themed for the local Wild West Extravaganza and they're selling like hotcakes. Barbeque, grilling, smoking--any kind of cowboy recipe is available. Jenna's father, Cary, retired FBI man; is on the outs with a neighbor, Sylvia Gump, who insists on throwing frequent outdoor cookouts with loud music despite the protests of himself and several other close neighbors. After Cary a In the fifth book in this mouthwatering cozy series, Jenna, owner of The Cookbook Nook, has stocked the shelves with books themed for the local Wild West Extravaganza and they're selling like hotcakes. Barbeque, grilling, smoking--any kind of cowboy recipe is available. Jenna's father, Cary, retired FBI man; is on the outs with a neighbor, Sylvia Gump, who insists on throwing frequent outdoor cookouts with loud music despite the protests of himself and several other close neighbors. After Cary and Sylvia have a heated argument, Sylvia's body is found skewered and smoking in her own backyard, and her husband insists he saw Cary running from the scene. Author Daryl Wood Gerber knows how to pen a lively and engaging plot from page one. The foods sampled by the characters throughout the story will make your tummy growl and recipes at the end of the book are an added bonus just for you. Lasso your copy of this book for several hours of reading entertainment! Crystal Cove is celebrating all things western, and Jenna and the Cookbook Nook are joining in by promoting BBQ. However, things take a tragic turn when one of Jenna’s father’s neighbors turns up dead in a bonfire. With her father a prime suspect, Jenna must find a way to clear his name. I truly love the different themes we get in this series, each one adds a unique flavor to the story. The characters are fabulous as well, and they definitely feel like old friends here. Toss in a plots with plent Crystal Cove is celebrating all things western, and Jenna and the Cookbook Nook are joining in by promoting BBQ. However, things take a tragic turn when one of Jenna’s father’s neighbors turns up dead in a bonfire. With her father a prime suspect, Jenna must find a way to clear his name. I truly love the different themes we get in this series, each one adds a unique flavor to the story. The characters are fabulous as well, and they definitely feel like old friends here. Toss in a plots with plenty of suspects and twists and you’ve got the recipe for another winner. Grilling The Subject by Daryl Wood Gerber is the 5th book in this wonderful series. Crystal Cove is celebrating a Wild West Extravaganza with lots of contests, activities, food tasting, stagecoach races and delicious recipes. A murder has occurred, Sylvia is found dead and this one becomes more personal to Jenna as her dad is a suspect. Jenna also has to think about her relationship with Rhett and her dead husband David in order to move forward. This story had twists and turns, plenty of suspects Grilling The Subject by Daryl Wood Gerber is the 5th book in this wonderful series. This story had twists and turns, plenty of suspects to keep you guessing. Love Jenna's cat Tigger and his personality and being back in Crystal Cove with her friends and family. This is a great cozy that I would recommend. The murder plot is well done and has plenty of suspects and clues to ke This is book number 5 in the Cookbook Nook Mystery Series, Grilling the Subject. The sleuth, Jenna Hart, finds herself investigating the death of an obnoxious neighbor to clear her father. Along with the murder investigation, a Wild West Extravaganza is in town adding to the drama, Bailey is in the midst of wedding planning, Jenna and Rhett’s own relationship is heating up, and finally, is someone following Jenna? If so, why? Daryl Wood Gerber has another hit on her hands. Grilling the Subject is jam packed with suspects, shocking surprises and loads of cowboy fun. Crystal Cove, California is hosting the Wild West Extravaganza and things are about to get wild. Jenna Hart and her friends are ready to put on their spurs, practice their yeehaws and enjoy some serious grilled and barbecued treats. Before the festival starts though, it seems there is some trouble brewing in Jenna’s dad’s picturesque neighborhood. Sylvia Gump’s encroaching on Cary (Jenna’s dad) and the others and that is not even the half of it. Realtor Ava is trying to rally the troops to put a stop to it and Cary is all for it. Someone however puts a stop to Sylvia all together with. Unfortunately, Cary is a suspect and he does not have any witnesses to his alibi. Even though Jenna has no desire to get involved in the murder investigation, she does not see much progress from Cinnamon and the Crystal Cove police force. What’s a daughter to do? Sylvia was not well liked so there are suspects aplenty. Add in affairs, possible blackmail and more and Jenna is faced with more questions than answers. Jenna also thinks someone is following her. Is she just imagining things? Fires are not limited to the grills either Things get scary and heated and the suspect list is still full. Sylvia’s personality definitely did not make her any friends, at least not any female ones. Aunt Vera does a tarot card reading on Jenna, whether she wanted it or not. Let me just say, Vera is good. A real shocker comes in play and turns Jenna’s life on end. No spoilers here, but hang on to your cowboy hats. That just complicates matters for Jenna in her hunt to prove her dad’s innocence. The suspect list seems to grow instead of getting shorter the more she learns about the deceased and her life. I was well and truly shocked by some things in the latest installment of “Cookbook Nook Mysteries”. Grilling the Subject is as enjoyable as a deliciously marinated and well grilled steak. Hot off the grill, this read is fun, fast paced and full to the brim with enjoyment. I love the characters and the friendships. The story is exceptionally well written and the mystery kept me guessing. I do not think you have to read the others in this series to enjoy this one, but read them too. They are all wonderful. I would recommend this cozy to any foodies and lovers of a fun mystery. Jenna is a great protagonist and her family and friends are always entertaining. Sink your teeth into Grilling the Subject and be ready for a spicy treat! Jenna Hart left her advertising work to help her aunt run a cookbook store in a small town. The business seems to pay just enough and she is settled in with a gentleman friend, good neighbours and hearty recipes to learn. The town is staging a rodeo with a nice touch - animal friendly performances. As this will attract tourists the Santa Cruz-area town is going all out to grab passing trade including trail cooking and barbecues which are called grills. I've been noticing a trend in light crime t Jenna Hart left her advertising work to help her aunt run a cookbook store in a small town. The business seems to pay just enough and she is settled in with a gentleman friend, good neighbours and hearty recipes to learn. The town is staging a rodeo with a nice touch - animal friendly performances. As this will attract tourists the Santa Cruz-area town is going all out to grab passing trade including trail cooking and barbecues which are called grills. I've been noticing a trend in light crime to throw in a colourful spectacle but make it just background, unrelated to the murder. A murder occurs, sure enough related to town issues rather than running a rodeo. The wealthy owner of the jewellery store has been angering some locals with her plan to buy up all the empty houses in town. This does occur and on a much bigger scale, so it's quite topical. Jenna also has someone walk back into her life whom she never thought to see again. This major issue distracts her for a lot of the book so her smart aunt has to do some of the sleuthing. The atmosphere and location are well described and all characters feel very real. Enjoy the rodeo and the recipes. Another winner in the Cookbook Nook series! There are no spoilers in this review but it's a doozy of a book. * Jenna knows food but doesn't cook. * The real life cookbook titles peppered throughout. * Food is a constant all the way through the book. * All the suspects and the way Jenna herself flip flopped during the journey to the truth. * The way Jenna doesn't share her Another winner in the Cookbook Nook series! There are no spoilers in this review but it's a doozy of a book. * The way Jenna doesn't share her uneasy feeling of being watched. * How nobody seems to hear her when she calls to them on the street. I usually try to pace myself during good books, I don't like to speed through it and miss some of the nuances. This book kept me coming back to read "just a little bit more" more times than I care to admit. There were a couple of times that I had to turn the dryer back on to un-wrinkle forgotten laundry. I had to heat up cold coffee more times than I care to admit. I may have even forgotten that the dogs were out in the rain. Jenna and the gang are back, in this fifth installment of the series, getting ready for the Wild West Extravaganza. This book is great, I loved every page. Full of yummy new recipes, descriptions of mouth watering food, and of course it takes place in Crystal Cove, CA, one of my favorite fictional cozy towns. I love Jennas bookstore, it would definitely be a place I would visit often! Her Aunt Vera is a hoot, always lots of fun to catch up with her, and I love how so many cookbooks and cozy myst Jenna and the gang are back, in this fifth installment of the series, getting ready for the Wild West Extravaganza. This book is great, I loved every page. Full of yummy new recipes, descriptions of mouth watering food, and of course it takes place in Crystal Cove, CA, one of my favorite fictional cozy towns. I love Jennas bookstore, it would definitely be a place I would visit often! Her Aunt Vera is a hoot, always lots of fun to catch up with her, and I love how so many cookbooks and cozy mysteries are mentioned throughout the book, makes me want to go buy them all. Jennas dad gets himself into some hot water, after an argument with a neighbor, who turns up dead! There are so many suspects in the book, Jenna has her hands full trying to clear her dads name. Throw in some twists and turns, and some romance too! There is a huge surprise in the book, I was shocked to say the least. I went through many emotions reading this, parts where I was happy, sad, even a little angry, then happy again! I think this is one of my favorites in the series so far. Such a great read, don't miss it! I enjoyed this book immensely -- from the Wild West Extravaganza, the wonderful barbecue recipes with cookbook references and cozy book recommendations, to, of course, a murder. The victim was disliked by many residents in the town of Crystal Cove, so there is no shortage of suspects. There are also some very unexpected twists and turns in the story as Jenna tries to exonerate her father of the crime and find the real killer. I really enjoyed my journey back to Crystal Cove and reconnecting with I enjoyed this book immensely -- from the Wild West Extravaganza, the wonderful barbecue recipes with cookbook references and cozy book recommendations, to, of course, a murder. The victim was disliked by many residents in the town of Crystal Cove, so there is no shortage of suspects. There are also some very unexpected twists and turns in the story as Jenna tries to exonerate her father of the crime and find the real killer. I really enjoyed my journey back to Crystal Cove and reconnecting with the characters who really have become like family to me. Jenna has really come into her own in this book and is a strong and vibrant protagonist. I highly recommend this book, and cannot wait for the next book to come out in Daryl Wood Gerber's wonderful Cookbook Nook series. This is a wonderful addition to a great series. Jenna Hart is a strong character and reading about her daily adventures is sure to put a smile on any reader's face. In Grilling the Subject, it's time for the Wild West Extravaganza in Crystal Cove and the delectable barbecued treats are bringing in the tourists. Local resident Sylvia Gump is a force to be reckoned with and has made plenty of enemies with her rude attitude and arrogant ways. When Sylvia's body is found in the remains of a fire, the This is a wonderful addition to a great series. Jenna Hart is a strong character and reading about her daily adventures is sure to put a smile on any reader's face. When Sylvia's body is found in the remains of a fire, the suspect list is long, but heading the list is none other than Jenna's dad, Cary Hart. This story was so good, I couldn't believe all the twists and turns that were going on. I received a digital copy of this book for my honest review from Netgalley and the author. This is another great book in this series. Jenna is bound and determined to figure out who killed Sylvia and to clear her father's name. So many people disliked her, and for good reasons! The characters and the town of Crystal Cove are all fun to get to know. The festivals that this small touristy town has are very interesting. Because of a certain surprising character showing up in this book, I do recommend I received a digital copy of this book for my honest review from Netgalley and the author. I love this series and this book did not disappoint. I have to say this was my favorite book in this series so far. I was hooked from the beginning and couldn't put it down. This book takes so many twists and turns, it kept me on the edge of my seat and I didn't want it to end. Jenna definitely went through a lot, but came out a stronger person because of it. If you love food, cats and people with a lot of personality, then this is the book and the series for you. I highly recommend it! Really enjoy this series. The author has developed a number of quirky characters and always has interesting plots. Can't wait to finish this newest addition. I like this series setting - a Cookbook book store and cafe. BUT - there were way too many "What if he .." "What did that mean.." "Did she know that.." musings from the narrator throughout this book. It overwhelmed this one for me. In Crystal Cove, they sure do like their Wild West Extravaganza. All of the shops decorate for the celebration and stock merchandise that would make an old cowboy happy. But when a dead body is found, the happy atmosphere takes a nosedive. And when Jenna’s dad becomes the number one suspect, she knows she has to investigate the murder and clear his name before the festival becomes his last rodeo. The characters are well rounded, well developed and three dimensional. I really enjoyed reading about the interactions between Jenna and her family and friends. Most of them are people you would want to be friends with and spend time with. The writing style flows smoothly and the book is an easy read. The author is very talented in her descriptive writing and through much of the book, I felt like I was right there watching all the action going on around me. The mystery is well plotted and carried on well throughout the book. Since the victim is not the most well liked person in Crystal Cove, there are many suspects to consider. There were enough twists and turns to keep me guessing and made it difficult to solve the mystery, which I like. I would recommend this book to anyone who enjoys a well crafted cozy mystery. This is the first book of the series that I have read and I did not have any trouble following the story and the characters. But like most series, I would think you would want to read all of the books, to see the character development and to just be able to spend more time with everyone. That is what I plan on doing. I received a free copy of this book from NetGalley in exchange for a honest review. I would like to thank NetGalley and Berkley Publishing Group for the opportunity to read and review this book. Grilling the Subject by Daryl Wood Gerber is the fifth book in A Cookbook Nook Mystery series. Jenna Hart and the town are getting ready for the Wild West Extravaganza that is coming to Crystal Cove. All the shops have decorated to reflect the wild west theme including Jenna’s The Cookbook Nook. Then Jenna finds out that the Shane Maverick is now running the WWE. They used to work together at Taylor and Squib Advertising in San Francisco. Shane is a type of guy that reminds you of a snake oil sa Grilling the Subject by Daryl Wood Gerber is the fifth book in A Cookbook Nook Mystery series. Jenna Hart and the town are getting ready for the Wild West Extravaganza that is coming to Crystal Cove. All the shops have decorated to reflect the wild west theme including Jenna’s The Cookbook Nook. Then Jenna finds out that the Shane Maverick is now running the WWE. They used to work together at Taylor and Squib Advertising in San Francisco. Shane is a type of guy that reminds you of a snake oil salesman (just what they do not need). Cary Hart, Jenna’s father and the other homeowners in the his neighborhood have been having difficulty with Sylvia Gump over some land. Sylvia is trying to take over other people’s property. Sylvia has taken to throwing loud parties (bands with electric guitars) and has even erected an ostentatious fountain (along with hedges and fences). Cary has a loud argument with Sylvia on the phone when she is setting up for another party. The next morning Sylvia is found dead by her fountain. Cary was out fishing at the time (by himself, of course) which means he has no alibi. Jenna will do whatever is necessary to clear her father off the suspect list (which considering Sylvia is quite long). Will Jenna be able to wrangle the real killer? Jenna has felt that someone is following her. She has only been able to see a shadowy figure. Who is it and why are the following her around town? Jenna is in for the shock of a lifetime when she discovers the individual’s true identity. Join Jenna as well as her family and friends for barbecue, iced tea, and other delectable delights in Grilling the Subject. “Grilling the Subject” is the 5th book in the Cookbook Nook series by Daryl Wood Gerber. This was actually the first one of that series that I had read, but I enjoyed it enough that I have since gone back and read the rest of the books in this series. Once again, I find myself wishing Goodreads and Amazon and some of the others would allow additional 1/2 star ratings. I would actually classify this book as a 4.5 out of 5. When I first started this book, I was immediately hooked by Jenna, Bailey, “Grilling the Subject” is the 5th book in the Cookbook Nook series by Daryl Wood Gerber. This was actually the first one of that series that I had read, but I enjoyed it enough that I have since gone back and read the rest of the books in this series. Once again, I find myself wishing Goodreads and Amazon and some of the others would allow additional 1/2 star ratings. I would actually classify this book as a 4.5 out of 5. This particular book finds our group and the town of Crystal Cove hosting the Wild West Extravaganza, a family-friendly, animal-friendly, Wild West style festival. While the festivities and the barbecue-themed foods occupy our heroine in her store and within the town, the murder in this book takes place away from the festival and its festivities. This murder once again has Jenna out looking for a murderer, this time because her own father has been accused at being at the scene! On top of all that, Jenna has her own surprise to deal with. I don’t want to spoil it, but it’s a doozy! It shakes up life for Jenna and her friends for a good chunk of the book. Cookbook Nook owner Jenna Hart is back with another murder to solve in Grilling the Subject, the fifth book in the series. This time however the stakes are a little bit higher for Jenna because it is her own father who stands accused of the crime. Crystal Cove, California is going all out for the Wild West Extravaganza coming to town and Jenna, like all of the other business owners is doing her part. 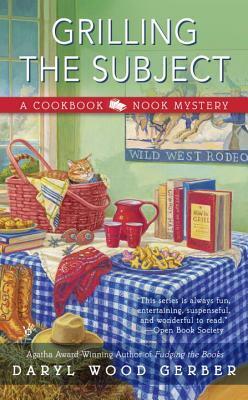 As people decorate and plan events to go along with the Wild West theme, the community comes tog Cookbook Nook owner Jenna Hart is back with another murder to solve in Grilling the Subject, the fifth book in the series. This time however the stakes are a little bit higher for Jenna because it is her own father who stands accused of the crime. Crystal Cove, California is going all out for the Wild West Extravaganza coming to town and Jenna, like all of the other business owners is doing her part. As people decorate and plan events to go along with the Wild West theme, the community comes together as only a small town can. However, there's always one person who just can't seem to get along with others. In this case it is Sylvia Gump (a name I consistently misread as GRUMP) who is upsetting so many people. Sylvia is just not a nice person. She's had an affair with one of the event organizers, threatened a local realtor, cheated people and encroached on her neighbors' land. When Sylvia is found dead, there are many possible suspects, but Jenna's dad was seen having an argument with her the night before so he becomes suspect number one. Jenna sets out to find the real murderer to clear her father. There are really two reasons to read this series. The obvious one is the murder. While the murder is well plotted, and there are some interesting twists, it is fairly easy to figure out if the reader pays attention. For me, the bigger reason to read this series is the cooking themes that each of the books is set around. This time it is all things BBQ. There are recipes at the end and actual cookbooks named throughout the book. (I have ordered two of them from Amazon already). I think the appeal of this and other similar series is that many readers enjoy visiting characters who live in small towns that pull together to have a good time and support each other when things go wrong. In our fast paced digital world, I think these books fulfill a longing for a sense of community. Grilling The Subject is the fifth book in the A Cookbook Nook Mystery series. Jenna Hart is out for a power walk when she sees people pointing and waving their arms. When she follows where they are pointing to, she notices that something is on fire and once she gets her bearings, she realizes that is quite near where her father lives. Arriving at her father’s she sees that it is a fire pit, on property whose ownership is under dispute, and the firemen find the body of Sylvia Gump. The night befor Grilling The Subject is the fifth book in the A Cookbook Nook Mystery series. Jenna Hart is out for a power walk when she sees people pointing and waving their arms. When she follows where they are pointing to, she notices that something is on fire and once she gets her bearings, she realizes that is quite near where her father lives. Arriving at her father’s she sees that it is a fire pit, on property whose ownership is under dispute, and the firemen find the body of Sylvia Gump. The night before, Cary Hart, Jenna’s father, had a heated discussion with Gump over the ownership of the land. Mr. Hart had left early in the morning to go fishing, alone. Therefore, Mr. Hart becomes a suspect in the death of Gump. Jenna begins her own little investigation into why and who might have wanted Gump dead. She soon finds that Gump had been a pain to quite a few of the locals. Another neighbor, Ava Judge a realtor, who Gump had threatened to report for unethical business practices. Shane Maverick, the head of the Wild West Extravaganza, who had had an affair with her and wants that information not to get back to his very pregnant girlfriend. There also is another neighbor, D’Ann Davis, an actress, who had purchased some jewelry that was not what it was represented as being. In additions to worrying about her father being arrested, Jenna gets some information that might affect the budding romance with Rhett. Another exciting visit to Crystal Cove and it’s likable and friendly residents. Delicious recipes are also included in the book. Looking forward to the next book in this enjoyable series. I always enjoy a visit to Crystal Cove and especially a visit to The Cookbook Nook. However, GRILLING THE SUBJECT is probably my favorite in the series! I loved the theme of the Wild West Extravaganza and how the author wove western themed activities, cookbooks, and food into the story. The town, and especially The Cookbook Nook, is charming and invites the reader to visit and linger. But it’s more than just a charming setting, GRILLING THE SUBJECT is about family connection and loyalty. When Jen I always enjoy a visit to Crystal Cove and especially a visit to The Cookbook Nook. However, GRILLING THE SUBJECT is probably my favorite in the series! I loved the theme of the Wild West Extravaganza and how the author wove western themed activities, cookbooks, and food into the story. The town, and especially The Cookbook Nook, is charming and invites the reader to visit and linger. But it’s more than just a charming setting, GRILLING THE SUBJECT is about family connection and loyalty. When Jenna’s past comes calling she has choices to make. She learns to grow and accept support by those she holds dear, even when she fears the worst. While this book can be read as a standalone, it answers questions that have been woven throughout the four previous books. Answers I’ve been wanting to know and Daryl supplies them in a worthy manner. There were plenty of viable suspects to keep me guessing right along with Jenna and the ending had a satisfying conclusion...GRILLING THE SUBJECT is a wonderful cozy mystery! And then there’s the food which makes this a mouthwatering book! So many delicious recipes are included along with so many references to dishes and cookbooks…I want to try them all. I plan on checking out some of the amazing cookbook titles mentioned by the author in this book and add to my own cookbook collection. I tried the Barbecue Muffins recipe at the back of the book and found it to be a delicious, fun dish to prepare! I am a huge fan of the Cookbook Nook series and this book did not disappoint. I have yet to read something by Daryl Wood Gerber that I did not like. She is very consistent with well written characters and quickly moving plots. Now that we are several books into this series, it is fun to see how the characters are growing and changing with their relationships. Jenna and Rhett, Bailey and Tito, and even Jenna's dad and Lola are getting more serious and I am looking forward to seeing where they a I am a huge fan of the Cookbook Nook series and this book did not disappoint. I have yet to read something by Daryl Wood Gerber that I did not like. She is very consistent with well written characters and quickly moving plots. Now that we are several books into this series, it is fun to see how the characters are growing and changing with their relationships. Jenna and Rhett, Bailey and Tito, and even Jenna's dad and Lola are getting more serious and I am looking forward to seeing where they are headed for the next book. Even Tigger, Jenna's kitten, is well on his way to being a cat. The Cookbook Nook is flourishing, and participating in Crystal Cove's latest tourist attraction, a Wild West themed week. The town is hosting everything from horse races, rope jumping, stunt fighting and more. Unfortunately, one of the local business owners is found murdered and the main suspect is Jenna's father. She finds herself caught in the middle as she tries to clear her dad's name.